Although the financial disaster of 2008 proved devastatingly quick, the evolution of the bad faith that drove the collapse is a more gradual story, and the one that David Bosworth powerfully narrates in The Demise of Virtue in Virtual America: The Moral Origins of the Great Recession — his sweeping history of the forces driving ethical, political, and economic change over the last sixty years. 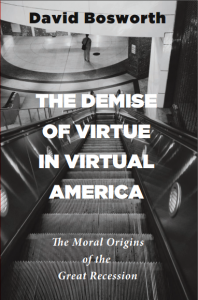 Here, Bosworth traces how the commercialization of both public spaces and electronic information has created a new and enclosed American place. Chapter by chapter, he then shows how the materialist values of this Virtual America have suffused our everyday lives, co-opting alike the themes of our narratives, the planks of our parties, the practice of medicine, the profession of art, and the most intimate aspects of our personal lives, including our beliefs about God, marriage, and childcare. Order here or here or here. 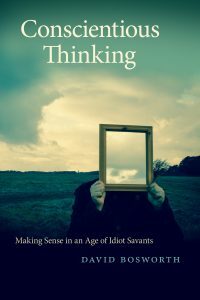 In Conscientious Thinking, David Bosworth cuts through all the noise of today’s political dysfunction and cultural wars to sound the deeper causes of our discontent. Americans are living, he argues, in a profoundly transitional era, one in which the commonsense beliefs of the first truly modern society are being undermined by the still crude but irreversible forces set loose by technology’s drastic revision of our everyday lives. He shows how this disruptive conflict between modern and post-modern modes of reasoning can be found in all advanced fields from art to medicine to science and then traces its impact on our daily actions, including changes in the ways friends relate, money is made, crimes are committed, and mates are chosen.